Apple has confirmed that two of its Irish subsidiaries pay around 2% in tax, however the company rejected claims that its Irish operation was used to avoid liabilities in the US. Appearing before a US Senate hearing on tax, Apple's head of tax policy Phillip Bullock confirmed that two Irish subsidiaries – Apple Operations Europe and Apple Sales International – paid approximately 2% in tax. When asked about its reasons for operating in Ireland, CEO Tim Cook said that the company had received a “tax incentive arrangement” as part of its decision to establish here in 1980. However he said the company paid all of its tax on US earnings, and had paid $6 billion to the US Treasury last year. 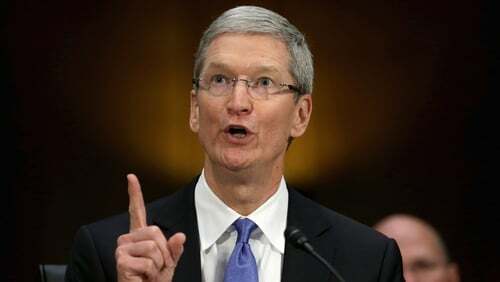 Money made outside of the US was “taxed in the local market”, Mr Cook said, before being transferred to Apple Operations International, which is registered in Ireland but managed and controlled in the US. Due to this arrangement, AOI is considered to be tax resident in Ireland or the US. However Mr Cook denied that its Irish subsidiaries existed purely to reduce the company’s tax liability. He said Apple now employs close to 4,000 people in Co Cork and that there was “a significant amount of decisions and leadership” in the country. However “the most strategic” decisions are made in the US. Earlier Tánaiste Eamon Gilmore said the alleged role of two Irish subsidiaries in helping Apple to avoid paying tax to the US authorities was not an issue for the Irish tax system. Speaking on his way into a meeting of EU foreign ministers in Brussels, Mr Gilmore said: "They are not issues which arise from the Irish taxation system." "They are issues which arise from other jurisdictions. That's an issue which has to be addressed, first of all in those jurisdictions and secondly … it needs to be tackled by having robust international agreements, and Ireland very much is in favour of that," he said. Mr Gilmore said the Irish tax system was "very transparent". "We want to see tax evasion and loopholes closed so that everybody pays their due tax including all companies. It is an issue that Ireland supports strongly at EU and at OECD level," he said. Mr Gilmore said that Ireland had 69 tax agreements with countries around the world. He said Ireland wanted to work with the EU and the OECD to ensure that there was a strong "anti-tax avoidance regime" in place. He said the Government would examine the US senate committee report. "But let's be clear about this. Ireland has a very strong, very transparent tax regime. "There are problems in other jurisdictions. Those problems are going to have to be addressed." This afternoon, Taoiseach Enda Kenny told the Dáil that Ireland "does not do special tax rate deals" with companies. Mr Kenny said the Government does not have low corporate tax rates for international companies. He said all companies pay the standard rate of 12.5% corporation tax and 25% on their non-trading companies. Independent TD Richard Boyd Barrett challenged the Taoiseach over his defence of Ireland's corporation tax. Mr Boyd Barrett said evidence is now mounting that Ireland is a tax haven and "one of the biggest facilitators for multinational companies dodging taxes". He said the companies want "all the profits" and "don't want to contribute to the societies that help them generate profit". Mr Boyd Barrett asked the Taoiseach how he could claim transparency, when a subsidery of Apple is making billions in profits and while paying 0.2% tax. He said that the story is "being discussed all over the world" and said the Taoiseach continues "the denial" that Ireland is a tax haven. The US Senate sub-committee led by democrat Carl Levin and Republican John McCain is investigating tax avoidance by US multinationals. The committee said Apple routes a large part of its international business through two Irish registered companies, Apple Operations International (AOI) and Apple Sales International (ASI). It said that AOI, though Irish registered, is not a tax resident of Ireland or any other country, and has paid no corporation tax to any government over the past five years. AOI accounts for almost a third of Apple's total profits. The second company, ASI, does make an Irish tax return, but in 2011 paid corporation tax of just $10m on profits of over $22bn - an effective tax rate of 0.05%. The Senate report said Apple executives claimed they had negotiated a special rate of corporation tax with the Irish Government, which has been less than 2% over the past decade. Apple, which employs up to 4,000 people in Ireland, says it complies with all tax laws, and its arrangements in Ireland enable it to fund high paid research and development jobs in the US, where it claims to be the biggest payer of corporation tax. Last year the company paid about $6bn in corporation tax, which it claims accounted for $1 in every $40 received by the US government from corporations. The committee said one of Apple's Irish subsidiaries - AOI - "declined to declare its tax residence" and filed no return of corporation tax liability in any country as a result. The report described AOI as Apple's "primary offshore holding company". Despite this the company has no physical presence in Ireland, nor does it have any employees. It has three directors, only one of whom is based in Ireland, and all its board meetings have been held in Cupertino in California, with the Irish director "attending" by telephone. AOI's assets are managed by an Apple subsidiary - Braeburn Capital, based in Nevada. Its bank accounts are located in New York, while its accounts and book-keeping is done at Apple's shared services centre in Austen, Texas. No AOI bank accounts or management personnel are located in Ireland. Because of this AOI does not qualify to be an Irish resident company for tax purposes, as Irish tax law - according to the Senate report - applies a "management and control" test or residence. But the US tax law applies a "place of formation" test of residence. As AOI meets neither the Irish nor the US test of residence, it is not tax resident in any country, and appears not to file tax returns or pay corporation tax. According to the Senate report, AOI accounted for 30% of Apple's total profits between 2009 and 2011. The Senate committee described another Irish company, ASI as its "primary Intellectual Property rights recipient". It said this latter company has, since 1980, had a cost sharing arrangement with Apple's US parent company to share research and development costs of Apple products. According to the Senate report, this arrangement has allowed it to "shift $74 billion" from the US to Ireland "where Apple has negotiated a tax rate of less than 2%". ASI is a subsidiary of Apple Operations Europe, another Irish registered company, which is itself a subsidiary of AOI. Until 2012 it had no employees, but last year, in a reorganisation, ASI was assigned 250 employees from its immediate parent Apple Operations Europe. Between 2006 and 2012, ASI held 33 board meetings, all of them in Cupertino, California. But it did file Irish tax returns. These recorded very low rates of tax paid over the past four years - the result, according to the Senate report, of a special tax deal negotiated with the Irish authorities dating back to the early 1990s. Between 2009 and 2011, the report claims the average rate of corporation tax paid by ASI was 0.6%. "Since the early 1990s, the government of Ireland has calculated Apple's taxable income in such a way as to produce and effective tax rate in the low single digits,'' the report said. Since 2003 this rate has been 2% or less - in one year, 2011, it was 0.05%. The report said its findings "demonstrate Ireland has essentially functioned as a tax haven for Apple, providing it with income tax rates approaching zero". It said Apple has cash holdings of $145bn, of which $102bn is offshore. The Senate committee has already published reports into the tax affairs of two other US high tech companies with significant Irish operations - Microsoft and Hewlett Packard. Burdened with a government debt of $16 trillion, and a shrinking corporate tax base, the US government is moving to the forefront of a growing group of countries that want to see an overhaul of international tax laws that will cut down the opportunities for companies to avoid paying corporation taxes. The issue of international corporation tax reform is likely to form a major part of the discussions at next month's G8 summit in Fermanagh. Greencore chief executive Patrick Coveney told Morning Ireland today that it was politicians across the world who were responsible for tax treaties and tax structures. "I find it frankly a little frustrating that it is them who are piling in and criticising international traded businesses who are merely availing of the tax environment that they have put in place," said Mr Coveney, a former president of the Dublin Chamber of Commerce.